Since starting at Room to Heal in September, I’ve been struck by the power of community. When things are tough or in happier times, our members, staff and volunteers really are here for each other. Room to Heal is a special place. My focus this year is on making sure that we continue the work of the community that Mark, Chloe and everyone here have worked hard to create. We have a highly talented and dedicated team. In 2019 I look forward to working together to ensure all our members, new and old, are supported through our therapeutic activities, casework, kindness and human connection. As a new year’s resolution, please consider starting a monthly donation to Room to Heal. The UN has awarded Room to Heal its first training grant to share our model internationally. Over the next year our founder Mark Fish and a co-facilitator will train organisations working with refugees in two countries in Africa. At our week-long therapeutic trip in south Devon, our therapists ran daily support groups and mindful movement sessions. In the autumn members also visited Tate Modern and Kew Gardens. We recently harvested peanuts, tomatoes, grapes, purple sprouting broccoli and Jerusalem artichokes in our garden. With the arrival of winter, we’re focusing on weeding, manuring, planting bulbs and tending our winter crop of garlic and salad leaves. A huge thanks to everyone who took part in our annual member and partner survey. The evaluation will be out soon. Mark Fish, founder director, is focusing on our international training programme (see above). Mark remains very much part of the Room to Heal family, but his new work means he’ll be around here much less. Chloe Davis, is leaving after 8 years. In that time, Chloe has worked as a therapist, fundraiser and Deputy Director. Her creativity, commitment and support have been outstanding. From everyone at Room to Heal, our heartfelt thanks. We wish you all the best. Jane Matthews started as our new Fundraiser in December. Jane has 17 years’ fundraising experience in the charity sector. Welcome, Jane. We’ve moved! If you’ve ever visited Room to Heal, you will know what a beautiful environment our office has. 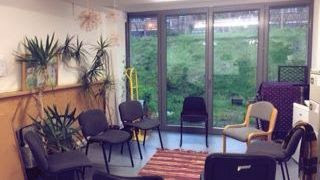 We’ve now moved downstairs which gives us more space and allows us to run both therapy groups here. Volunteers are at the heart of Room to Heal – from IT and payroll to cooking and gardening, and from casework, admin and fundraising to listening and talking. A huge thank you to Paul, Jo, Lewis, Carey, Kate, Mary, Mariko, Jane, Sally and Andy. Read Andy’s blog on our website about volunteering at Room to Heal. A particular thank you to Bullet Creative for designing our new website and donating their time. Also to Paul, Lewis and all the members who have helped ensure our office move went smoothly and we have a lovely new home. Thank you to each and every one of you for your great support for the Room to Heal community. We couldn’t do it without you.